Officials with the National Safety Council (NSC) are working to raise awareness about the risk of the #1 cause of workplace fatalities — distracted driving. Did you know that cell phone distracted driving policies are the best way to do just that? Distracted working drivers cause close to 2,000 workplace fatalities each and every year. It is imperative that employers eliminate financial or other incentives that encourage workers to text while driving. Employers who require their employees to text while driving–or who organize work so that doing so is a practical necessity even if not a formal requirement – violate the OSH Act. Our work injury attorneys urge employers to download a sample cell phone policy kit, customize it to your organization’s needs, and let your employees know that you support distraction-free driving. Hang up posters in the office to remind employees that “One Text or Call Could Wreck It All.” As it stands now, Massachusetts’ state law already bans drivers of all ages from using text message devices behind the wheel. But these laws are not effective without enforcement. Some of the most important enforcement efforts must come from employers. Step up today and help to save lives. No one denies the dangers of texting while driving. In fact, 95 percent of AAA survey respondents said texting behind the wheel is a “very” serious threat to their personal safety. But 35 percent of the same respondent group admitted to having read a text or email while driving in the last 30 days. 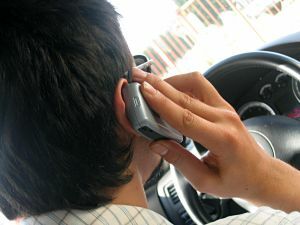 Employers may be concerned with a lack of productivity if their drivers aren’t connected to cell phones. A recent survey of NSC members found that 99 percent of companies that have a cell-phone policy in place did not experience any loss of productivity (the biggest excuse companies have for not having a cell-phone policy – many companies find that productivity actually increases). But this is a problem that goes beyond motor vehicles. Consider the forklift driver who reads an email message while moving and stacking 5,000-pound pallets around your warehouse. Or the construction or utility worker who takes a call while positioned 20 feet up on a ladder or utility pole. These types of day-to-day dangers don’t reel in the media hype that surrounds texting while driving, but distracted driving and working can nonetheless lead to tremendous exposures for employers, often on multiple fronts and sometimes in indirect and non-obvious ways. The average text takes a driver’s eyes off the road for nearly five seconds. The message being conveyed is that texting while driving isn’t multitasking, it’s essentially driving blind. When this is done by a driver operating a big-rig, tractor-trailer or a semi-truck, the consequences of an accident are much more severe in these cases. “Workers, however, may be required or pressured by job demands to engage in distracted driving behaviors. Strong employer policies to curb the use of cell phones and in-vehicle technologies while driving are an important tool in creating a safe driving culture within an organization,” said John Howard, M.D., with the National Institute for Occupational Safety and Health (NIOSH).